The Goodman® GSZ16 16 SEER Heat Pump uses R-410A & features operating sound levels that are among the best in the heating & cooling industry. With its 16 SEER rating, the GSZ16 will help reduce energy consumption throughout the life of the system. The Goodman GMVC Two-Stage, Variable-Speed Gas Furnace features a patented aluminized-steel tubular heat exchanger & energy efficient Hot Surface Ignition system. This furnace is run-tested for heating or combination heating/cooling applications. 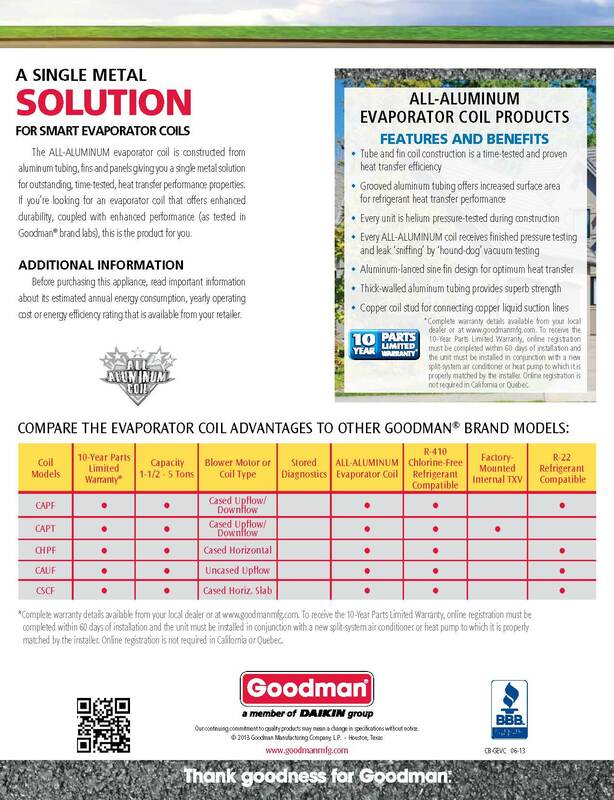 The Goodman® CAPF/CHPF Cased Indoor Coils are made for split system air conditioners and heat pumps. The coil’s cabinet is painted Architectural Gray.